Every so often, our blog points toward Alaska. The largest state in the nation, Alaska has been the home of multiple AutoSlash team members and a favorite vacation destination of others. While Alaska is well-known for having no personal income tax and no statewide sales tax plus a check to all year-round residents from the Alaska Permanent Fund, there are taxes on activities, products, and services (almost) sufficient to pay for various government services. Alaska -- bigger than Texas -- decided one option was to impose Texas-sized taxes on their rental cars, particularly in Anchorage. Go north, the (tax) rush is on. The tax and fee burden starts at the state level, then continues to the airports controlled by the state's Department of Transportation & Public Facilities, and then includes any taxes and fees imposed by the city where the rental site is located. Rent a car within Alaska and there's automatically a 10% Vehicle Rental Tax unless the rental is more than 90 days. According to the Alaska Department of Revenue, that $12+ million per year comprises 1/60th of the entire state's budget. Pretty impressive considering the peak tourist season and shoulder tourist season combined is just 4 months each year (mid-May through mid-September)! These proceeds go into the General Fund, where the Legislature may use the proceeds to help tourists or for any other legal purpose. Hint: The answer isn't tourists and the debt of Alaska's airports was downgraded despite being state-owned entities. The rental car companies have to pay for space at the airports (otherwise, there would be too many rental companies seeking space). The rental car companies then have to fork over 10% of all rental revenue, which gets disguised as an "11.1% Concession Recovery Fee" assessed on renters (10% of 111.1% is 11.1% -- this is the first fundamental theorem of "airport rental car calculus"). The renter gets charged an additional $7 per day to help pay off the consolidated rental car facility (CONRAC) at Anchorage International Airport. A renter who rents for two weeks pays off 14 times more debt for the facility than the person who rents for one day, even though each creates the same amount of wear (leaves once, returns once). After all that, the State of Alaska is finally done collecting their share. Next up is the city where the rental car company is located; each city has a right to tax rental cars and the range goes from 0% to 8%. As this is a Fee Detective article, one can easily guess that Anchorage selected 8%. The city does (mercifully) caps the total city tax on a rental at either $120 or $240, depending upon vehicle type. State capital Juneau charges 5%, while Fairbanks and Russia-adjacent Wasilla charges 0% in city rental car taxes. As a result, visitors to largest city Anchorage thus face the consistently largest tax and fee burden when visiting the 49th state. During the peak summer period, it's common to see tax and fee burdens alone exceed $50 per day on high-demand, expensive cars such as minivans and large SUVs. And sadly, some rental companies (and their affiliates) block users from redeeming free rental days during peak summer periods; redeeming award days is ordinarily one of our favorite tricks for minimizing the taxes based upon rental costs. And we're not kidding about the tax and fee burdens during peak tourist season -- this real-life one-day minivan rental has $72.72 in taxes and fees on top of a $225 base rate. Anchorage anchors us down with taxes and fees. 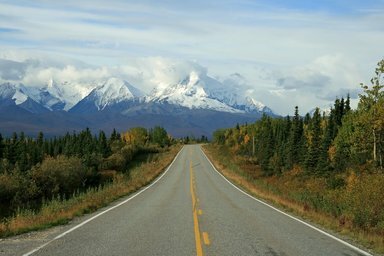 Going to Alaska this summer and need a rental car? The combination of high peak rates and high taxes means those who plan the furthest in advance benefit most. Book your "Free Cancellation" rate and track at AutoSlash.com/Track now; that gives us the greatest number of days to look for lower rates on your behalf! Otherwise, every additional dollar in rental car rate is going to be greatly compounded with various taxes and fees. Fees, facility charges, and taxes got you confused and/or down? The Fee Detective can explain. Send your query to feedetective@autoslash.com and we'll feature your question in an upcoming post.